We hoped for good weather, and all Alex and Marianna wanted for their engagement photos was a location that they could take in beautiful mountains. Then the day came for their engagement session and the mountains were not only socked in by smoke, but there was also crazy wind and torrential rain! Not exactly what you want for your engagement photos. We postponed a week out, hoped for better weather, and boy did it ever deliver. I had so much fun exploring around the Pitt Lake area with them, finding the best spots to take in the lake and the mountains. We talked about how hard wedding planning can be and how much time it takes up. So I shared a little secret with them that I thought of about a year ago. When you get engaged get a jar, every time there is something you think of that you want to do together, but can’t because you need to do wedding planning/errands write it down and put it in the jar. Then over then your first year of marriage, when you have time to do something together, pull a piece from the jar and do what it says! It’s a fun and exciting way of still doing all the things you want to do together. These two are so natural with each other and I simply love the way their photos turned out! I was great to hear more about their plans and I can’t wait for the April wedding next year! 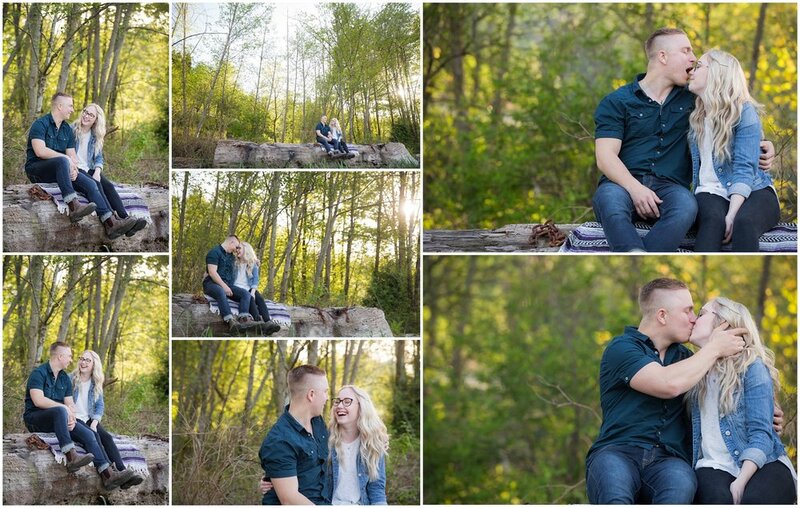 I’ve been lucky enough to get to do a few different sessions for Kristen and Justin over this past year. When she approached me to do an at-home couples session, in their newly renovated townhouse, how could I say no? These two are so much fun to photograph and I love this super cuddly session! When I first met Kelsey and Zee I absolutely loved hearing about their proposal story. I can only imagine the stress that goes into planning a proposal for a guy, to only then have the weather cause your plans to fall apart. Zee had planned to purpose on a Whale Watching trip, but the winds picked up on the day of their tour and it was cancelled. While a week isn’t a long time I’m sure the next week went by at a snail’s pace for Zee until he got his second opportunity to ask Kelsey to be his wife. Now these two say they have never done photos before but you would never know it by looking at their session! They absolutely killed their engagement photos and were complete naturals in front of the camera. I am so excited for their wedding in February and to get them back in front of my camera again! When I first met Stacey and Dave and they mentioned that they were wanting to do their engagement photos at the dairy farm where Stacey works, my response was, “Heck yeah!” Like, come on? Getting to hang out with an amazing couple and cows? Totally up my alley! Stacey and Dave met through friends and their mutual love of camping and the outdoors. I think this is one of the reasons that we clicked when we first met. They have a number of family pets, include a few dogs that they love to take on hikes. Stacey also has a pet cow that lives in their backyard! I may have destroyed a pair of old shoes, and came home with poop on my legs and pants, but it was totally worth it! We can’t wait for their wedding next April! We first met Marie-Eve at the All Dressed in White Wedding Show at the Anvil Centre in April. She was the lucky winner of our Ultimate Engagement Session with hair and makeup by the fabulous Makeup by Rae, and dinner at The Keg on us! They wanted to have a summery session, so we picked a day in July at Campbell Valley Park for their sunset engagement session. We spent the whole session laughing and talking about their wedding in May 2018. It was great to hear about how they met, their son, and all the plans for their big day. I’m super excited that we get to be part of their wedding day next year, and I absolutely love the photos from their engagement session! There are people in this world that you just click with, and Katie and Jesse are two of those people! 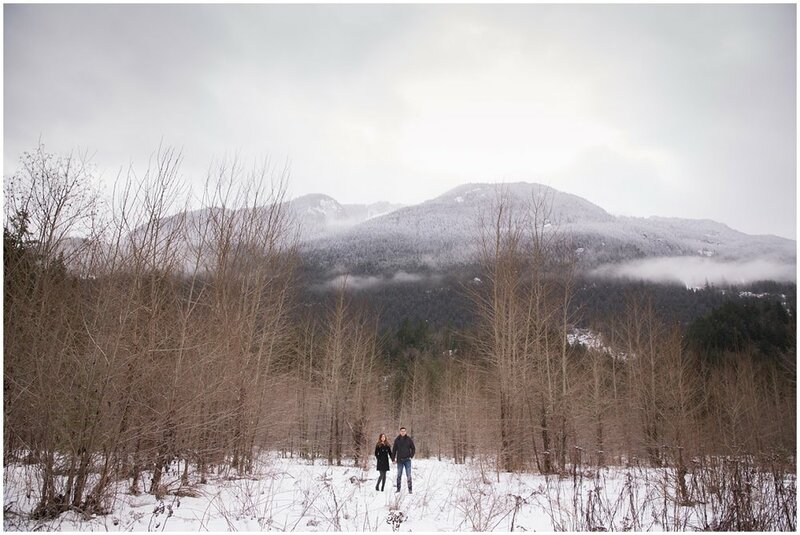 When I first started to hear about their love story and the plans they had for their wedding at the Fraser River Lodge, I was instantly excited. So when they picked us to be their photographers I was over the moon! When we first started to plan their engagement photos, they told me they wanted water and mountains and I instantly knew Barnet Marie Park would be the perfect spot! Luckily for us the sun came out that day and we had the most spectacular light. I think we walked around for hours chatting about their big day and finding some amazing spots to do their photos. One of the things I strive to do is capturing my couples the way they naturally are with each other. I think you can really tell by their photos how in love they are and how much fun they have with each other! I’m so excited for their wedding day in March when I can get them in front of my camera again! The cherry blossoms always provide the most amazing backdrop for photos. So needless to say I was super excited when Meredith and Michael said they wanted to have them in their engagement photos. The tricky part with cherry blossoms is that they don’t always bloom at the same time each year. And when they do, they are usually only here for a short amount of time. This year they definitely bloomed much later than normal, with the crazy snowy winter we had. Once we saw the blossoms coming out we quickly planned to meet up one morning at Queen Elizabeth Park. It was a perfect morning with the sun starting to peek through. We walked all over the park, taking in some of the best spots for photos chatting about their big day in October. They were both absolute naturals in front of the camera and I can’t wait for their big day! When I first started talking with Beth about their engagement photos, she told me that they wanted a woodsy setting. 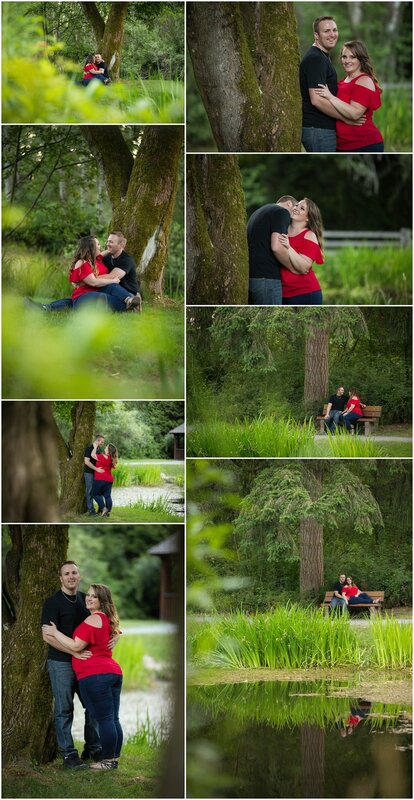 I have always loved hiking in Minnekhada Park and knew it would be the perfect backdrop for their session! We met up with them one Sunday morning in March, and found some of the most amazing spots to do photos in amongst the trees and along the water bridge! And hey, at least this time I remembered to put all my gear into my backpack instead of my rolly-case. I loved the pop of Beth’s blue shirt against the trees. These are definitely some of my favourite images from this spring! And hearing all about their upcoming April wedding made us even more excited for their big day! We first met Kiersten and Josh in January at the All Dressed in White Wedding Show at the Sheraton Guildford hotel. I remember talking with them as they stopped by our booth, and hearing about their winter wedding coming up the following January. Lucky for them, and for us, Josh’s name was drawn for our show give-a-way. They won our Ultimate Engagement Session with hair and makeup by the fabulous Makeup by Rae, and dinner at The Boathouse on us! About a week after the show I was able to meet up with them at a local coffee shop. They told me more about their big day and we planned out their engagement session. Funny enough I found out they live super close to me, and they also have a happy dog named Ruby. We had probably even passed each other while walking our dogs through the neighbourhood! They really wanted to have a snowy engagement session, and with all the snow we had this past winter it didn’t seem like a hard request! So we planned a date at the end of February and headed up Seymour Mountain to play in the snow. It was the second time that I had to bring out my snowshoes for a photo session. The running joke throughout the session was that although I was the only one with snowshoes on, I was also the only who fell over! After getting all the snow photos and also getting a few with Ruby, we headed down to Cates Park to take in the sunset. To me these looked like two totally different sessions done at completely different times, which is awesome! This is one of the many reasons I love the lower mainland: you can basically get two totally different sessions within a short drive of each other! To say we are excited for their January wedding at Swan-e-Set is an understatement. But I’m also super excited for doggy play dates at the park with these two amazing people, and Ruby of course! I first met Kristen and Justin in the summer time when I put out a model call. I wanted to get some new images for my new website. We headed out to Whonnock Lake and snapped away as the sun set over the lake. It was evident right from the start of our session how natural these two were in front of the camera! Fast forward a few months later, with fall setting in and winter fast approaching, Kristen tagged me in a snowy photo on Instagram. As soon as the first snow fall hit I knew I wanted to get these two in front of my camera again. 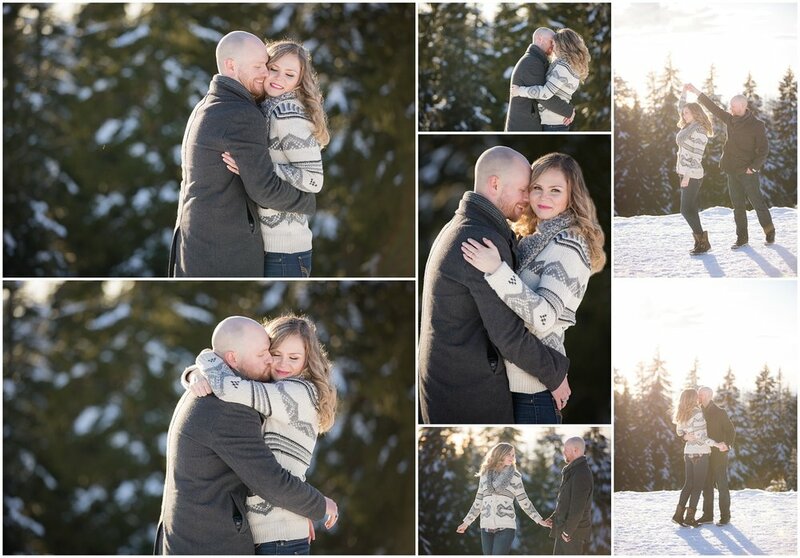 So we set up some time to go up towards Chilliwack Lake on New Years Eve for a super snowy session. Luckily we had our personal guide with us, Leanne of Simply Photography, to show us all the cool spots. Well, I don’t know what more to say other than these two belong on a magazine cover! I can’t wait ‘til our next session together as they’ve kinda become a bit of a muse for me. Kristen, time to start tagging me in more Instagram posts so we can plan our next session! Our first wedding of 2017 is about to take place next month, so I couldn’t think of a better moment to post one of my favourite engagement session from 2016. We met up with Katrina and Bruce out at Hatzic Lake on a warm fall afternoon in October. The leaves were a perfect golden colour and the day was crystal clear! I know they were nervous at first to get in front of the camera, but it was evident from the first shot that they were beyond naturals! As we moved around the lake you could just see how in love these two are with how cuddly they got with each other. We then started to make our way up to Cascade Falls, making a quick stop at a blueberry field where the leaves had turned a vibrant red! I love discovering new spots, and Cascade Falls didn’t disappoint! We can’t wait to get these two back in front of our cameras next month for their wedding. We know it will be an amazing day with lots of love, laughter, and even more cuddles! I was so excited when Rosemary came to tell me that her and Alan were getting married! Rosemary and Alan are good friends of my husband and I, Alan even being one of my husband’s groomsmen at our wedding. We have all been waiting for the day that they were finally going to get married. I even handed Rosemary my toss bouquet at my wedding and told her your next! Flash forward almost a year after our wedding and I finally got the message… we are getting married! The best part was that I knew before my husband did, so I had to keep it top secret until Alan had a chance to tell him. I was so excited to be able to get to photograph their wedding story for them. After a few rain cancellations we were finally able to meet up at the UBC Botanical Gardens for their engagement session. All the beautiful rich fall colours were a stunning backdrop to their photos. After walking around the park and finding all the best places for photos we headed to Gastown to one of their favourite pubs for a few more pictures. I do a lot of outdoor engagement sessions where we take in the beauty of BC, so it was cool to be in a totally different spot. The pub was empty so we were able to take advantage of the best “snug” and they cuddled up for a few more photos. It was great to hear more stories about how they met, their first date, and all about their love story. I can’t wait for their December wedding at a super cool location that is totally them!! We can’t wait for Saturday so that we can celebrate the wedding of Rhea and Dave, but first let’s flash back to their summer engagement session at Pitt Lake. I’ve known Rhea for years and I’ve even had the honour of taking her photo when she was a bridesmaid in a wedding that we photographed a few years ago. I was so excited the day I saw on Facebook that Dave had purposed and that these two amazing people were going to be saying “I do”! 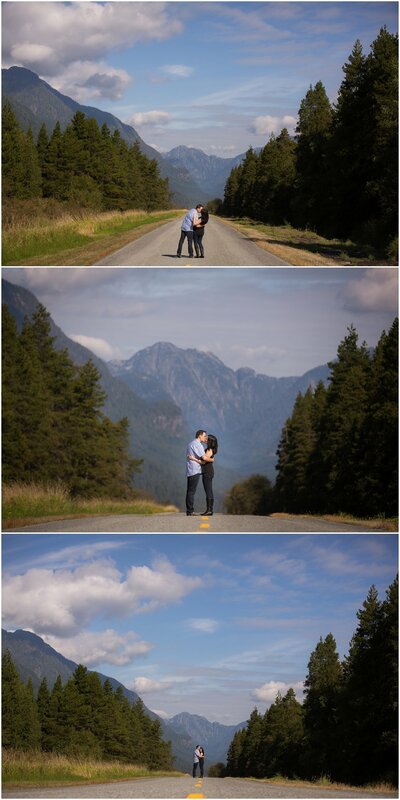 Over the summer we met up at Pitt Lake to do their engagement session. I always like to find new spots and cool little areas, so we set off down a path thinking that it was going to take us on a quick loop. Not so much. We stopped along the walk at different spots and 45 minutes later we finally got to about the half way mark along the path. Since it was starting to get warmer and the sun getting higher in the sky we decided to back track to the parking lot the way we came. It wasn’t the set planned path but we still found some amazing spots. We laughed so much throughout their session and Dave even tried to catch a snake so he could chase us with it. This weekend will be amazing and I’m sure it will be full of much more laughter and so much love between these two and their families! When I first met Danielle and Andrew over a year and a half ago, I knew that wanted to be part of their wedding day. The more I learned about their wedding and their plans for their engagement session I grew even more excited to tell their love story. They really wanted to do their engagement session at the Othello Tunnels and I couldn’t be more excited! So we planned a date in May for their engagement session, but found out just a few weeks before that the location we were going to shoot at was closed for another month. So we picked a new date in July, certain it would be a beautiful day. We even decided to meet really early in the morning to avoid the heat of the summer weekends. And when the day arrived it rained, but they were totally game for still doing the session. So we hiked into the tunnels and got some amazing shots inside them and around the surrounding cliffs nearby. The tunnels were part of the Kettle Valley Railway lines and are a big part of British Columbia’s railroad history. If you are ever out in Hope, I encourage you to take an hour or two to go and explore the area! After walking around the tunnels we headed over to Lake of the Woods on the other side of Hope, which is another spot I’ve always wanted to do photos. Both Danielle and Andrew were rock stars in front of the camera and so natural with each other. This past weekend we got the chance to continue to tell the love story of Danielle and Andrew, and we can’t wait to share some photos of their big day with you soon. Erika contacted me a few weeks back about doing an engagement session for her and her fiancé Mark. They are getting married in Mexico next year and wanted a very Vancouver feel to their engagement photos. So on a sunny Sunday afternoon we met up with them at Granville Island, a perfect spot for that Vancouver feel! As we started taking photos we were chatting about how her and Mark met at work, funny enough the same place my husband use to work years ago. Then our worlds got a little smaller, Erika studied Biotech at BCIT and my dad was one of her teachers! We did a full lap of Granville Island finding little nooks to take some amazing photos for them. We loved getting to know them and their love story and we are so happy that we were able to capture this special moment in their lives! Tomorrow is Laura and Steven’s wedding day and we couldn’t be more excited!! I remember back to meeting up with Laura and Steven at Starbucks to talk about their big day, and I knew from that meeting that I really wanted to be their wedding photographer. We sat and talked for almost 2 hours, and it truly felt like I was sitting down with a long-time friend catching up on all the things that had happened over the past few months. I was so excited when she emailed me back and told me that they wanted me to be their wedding photographer! A week later we met up again on a stormy August day to go through the contract and set up all the details. That was the day of the crazy August 2015 storm which knocked out power to some parts of the Lower Mainland for days! Little did we know at that time that their venue, Redwoods Golf Course, was pulling out all the stops to make sure that the weddings on that stormy weekend went on without a hitch. 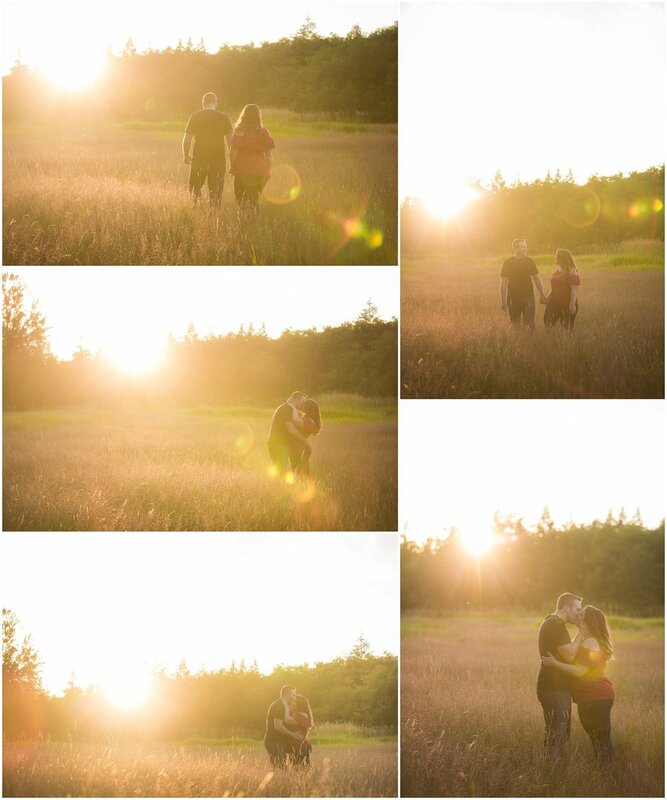 Fast forward to May 2016, and we were all set to do their engagement session at Buntzen Lake. It was a beautiful day. Bright and sunny, but not too warm. Laura had mentioned to me a few days before their session how much she wanted to incorporate a vintage couch into their photos. And luckily enough, my husband and I took an upholstery course at The Passionate Home in Langley that past winter and I had just finished refinishing and upholstering a love seat. So we packed the couch up and headed out to the Lake! It was quite the site to see me walking about with a love seat hoisted above my head, but it was totally worth it! We got to hear a lot about all the amazing details that they were putting into their big day, making us even more excited to be part of their wedding! So here we are today, less than 24 hours until they are husband and wife. We are so excited to be back at Redwoods Golf Course celebrating amongst Laura and Steven’s Family and Friends!